Not one size fits all. We meet with you at your boat to establish your needs and desires. We will photomodel your boat, computer generate your bimini, enclosure, or dodger, and place it on the photo of your boat, so that you can see exactly what the finished product will be. The lines of your boat are considered as well as headroom and visibility requirements. All frames are designed using Autocad. We use only heavy walled, (.065) stainless steel tubing and stainless steel fittings. The frame is supported, whenever possible, by rigid supports to make your frame strong, as well as to keep pathways clear of straps. Once the frame is installed and adjusted, the set screws are removed and replaced by 3/16″ stainless steel rivets to assure safety while underway. All our biminis — whether for power or sail boats — are designed to meet your headroom, shade, visibility, and aesthetic requirements. In addition, our sailboat biminis accommodate backstays and running rigging. “U” zippers can be installed in most panels. Screens can be included. Roll up straps are provided. Choose either the “California Style”, where the clear vinyl sides zip off, or the “Traditional Style”, which is all one piece. The center panel opens for ventilation on both. Leather reinforces the aft bow where people tend to grab on. An extra handhold can be added aft or on the sides. 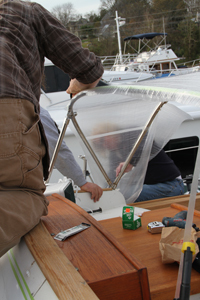 A covered zipper can be added to accommodate a fly or a connector to a bimini. Priced by the linear foot, we measure your furled sail. The mast collar has Velcro® and a tie for ease of putting on the cover and security. A covered zipper secures the front, twistlocks are used in the bottom, with attention to sheets, vangs, and other obstructions. Chafe protection for winches and other hardware is installed where appropriate. Custom graphics are available for a distinctive look. All sorts of covers can be made for any part or accessory of your boat, such as hatches, grills, bicycles,etc. Our specialty bags are built to last at sea and on your favorite beach. Not only do you get to select the bag style, but you get to choose the chart area displayed on its side! 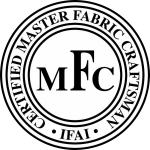 With extensive fabric samples on view in our showroom plus access to Design Centers through our membership in the American Society of Interior Designers, we can provide just the look you envision. Ultrasuede®, Ultraleather®, Sunbrella®, plus reasonably priced and durable upholstery fabrics, can suit your needs. We pattern your boat, you choose your style. We can create a tailored look with a boxed,welted cushion, or add button tufting, knee rises, and other features to individualize your boat. Drapery, pleated shades, hand operated or motorized blinds enhance your windows. Bound carpet from R&R Textiles is a durable, attractive answer for removable carpet. Sleeping surfaces: we can build you a comfortable cushion using quality foam, or we can provide an innerspring, or foam combination mattress for you. Fitted sheets, mattress pads, decorative pillows, bedcovering, and table linens can be designed with you in mind.